As we feared in a recent opinion piece, the US Supreme Court’s decision to unarm the Alien Tort Statue (ATS) creates a fall-out for environmental justice cases worldwide. 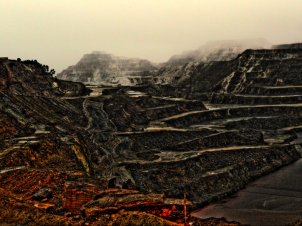 One and a half years ago we wrote about the victims of Rio Tinto’s human rights abuses in Papua New Guinea – who were trying to get justice in the US. But after 13 years of legal struggle, Rio Tinto managed to get rid of this thorny issue – exactly because the ATS has been unarmed in the Kiobel case and no longer applies to violations committed outside of U.S. soil. Roughly 10,000 current and former Bougainville residents now have little hope to make Rio Tinto accountable for the massive human rights violations and thousands of deaths linked to their resistance against environmental crimes in the copper and gold mine that Rio Tinto once ran. The mine closed in 1989, when the by then armed victims took it over and an eight-year guerrilla war ensued. The government, directly supported by the Australian military, proceeded with aerial bombing, village-burning and other acts of retaliation. A sea-embargo was supposed to get the islanders on their knees in a few weeks time, but was given up 8 years and thousands of deaths later. The legal claim, filed by a Seattle lawyer, Steve Berman, alleges that the company brought financial influence to bear on Papua New Guinea’s government, which is accused by the plaintiffs of killing 15,000 islanders. But the prospect of justice is looking increasingly dim. The Supreme Court’s April 17 decision in Kiobel v. Royal Dutch Petroleum Co has thus become a sad precedent. For three decades, lawyers and human rights activists have used the ATS as a way to hold multinationals accountable for a variety of human right abuses. Had it been replaced by a well functioning international environmental court where anyone could hold multinationals accountable, nobody would have missed the powers of the ATS. But with the new limits on cases that can be brought under ATS and the continuing lack of a global forum for environmental justice – justice for these corporate crimes appears ever more elusive . The case is part of EJOLTs database on environmental conflicts and will be part of the global map launched late 2013.